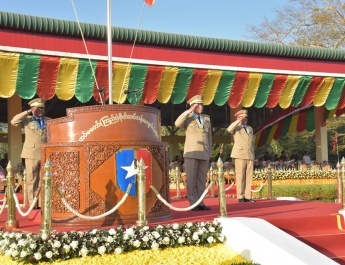 The seventh Maha communal Kathina donation ceremony of families of the Office of the Commander-in-Chief (Army, Navy and Air) took place at Anawrahta Hall of the Office of the Commander-in-Chief (Army), here, this morning, attended by Commander-in-Chief of Defence Services Senior General Min Aung Hlaing and wife Daw Kyu Kyu Hla who donated Kathina robes and alms. 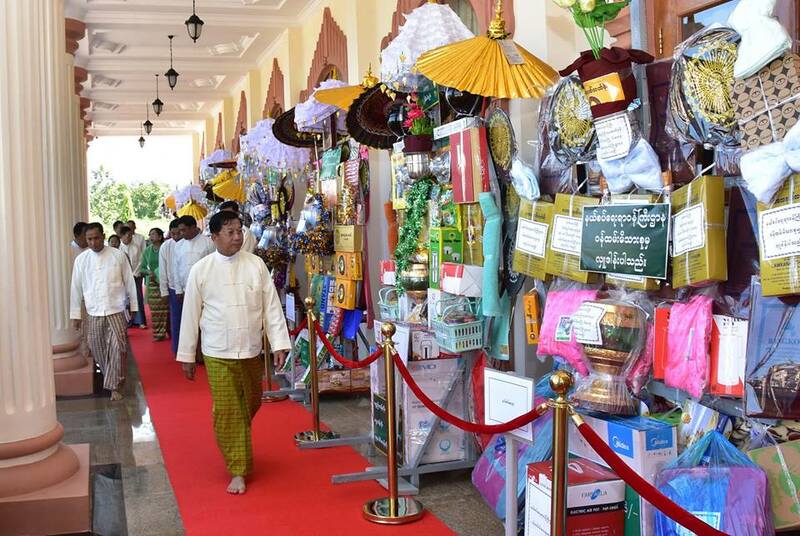 First, the Senior General, wife and congregation viewed round Kathina robes, alms and Padethabins displayed at Anawrahta Hall for donations to monasteries. 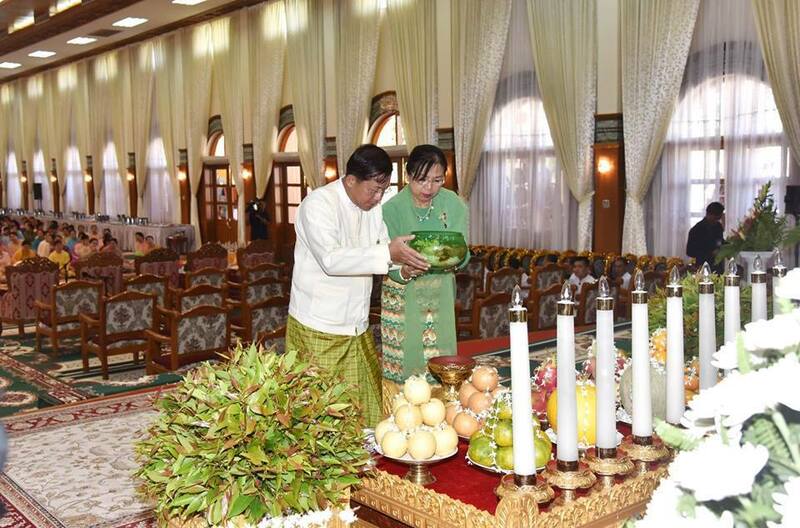 Next, the Senior General and wife offered oil lights, water, fruits and meal in the emerald alms-bowl to the Buddha Image in the hall. Afterwards, the seventh Maha communal Kathina donation ceremony started. 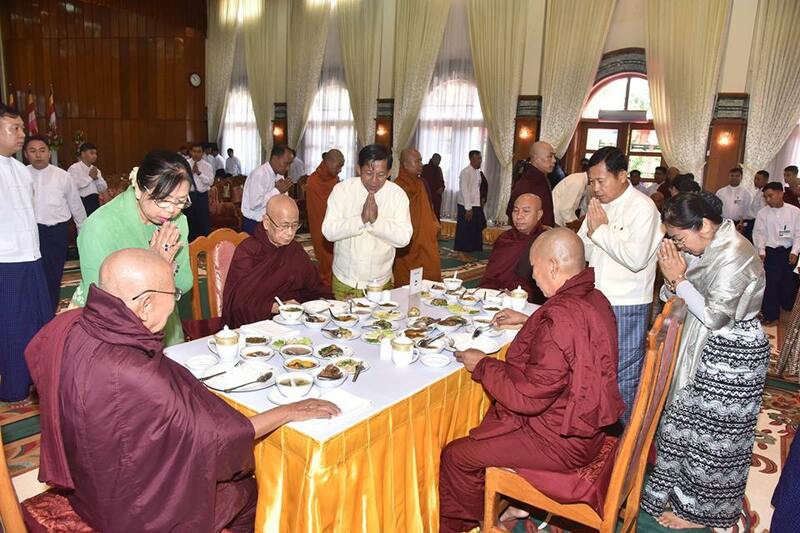 It was attended by 72 members of the Sangha led by Abbot of Pyinmana Zaygon Monastery State Ovadacariya Abhidhaja Maha Rattha Guru Bhaddanta Kavisara and Abbot of Maha Wizitayon Monastery from Mandalay Abhidhaja Maha Rattha Guru Bhaddanta Vicarindabhivamsa, Senior General Min Aung Hlaing and wife Daw Kyu Kyu Hla, Deputy Commander-in-Chief of Defence Services Commander-in-Chief (Army) Vice-Senior General Soe Win and wife, Union Ministers and their wives, senior military officers from the Office of the Commander-in-Chief and their wives, officers, other ranks and families. The congregation led by the Senior General took the Nine Precepts from Presiding Nayaka of Yezin KanU Pariyatti Monastery of Zeyathiri Township Sayadaw Sasanadhaja Dhammacariya Maha Gandavacaka Pandita Bhaddanta Vilasa. Members of the Sangha recited Metta Sutta. Then, Senior General Min Aung Hlaing and wife Daw Kyu Kyu Hla offered Kathina robes and alms to the Presiding Nayaka of Yezin KanU Pariyatti Monastery. Vice-Senior General Soe Win and wife Daw Than Than Nwe also donated Kathina robes and offertories to the Abbot of Zaygon Monastery from Pyinmana. Afterwards, the Union Minister for Home Affairs and wife, the Union Minister for Defence and wife, the Chief of the General Staff (Army, Navy and Air) and wife, the Commander-in-Chief (Navy) and wife, and the Commander-in-Chief (Air) and wife donated Kathina robes and alms to members of the Sangha. 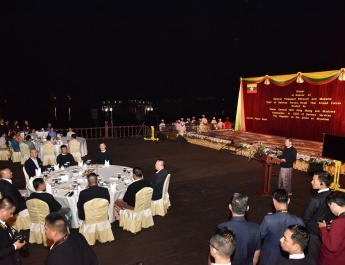 Senior military officers of the Office of the Commander-in-Chief (Army, Navy and Air) also presented Kathina robes and donations to members of the Sangha. Then, Ashin Vayama and Ashin Javana, Ganavacaka lecturer Sayadaws from Yezin KanU Monastery, held the question and answer session on Kathina processes. Next, the Senior General and party took a sermon, delivered by Abbot of Pyinmana Zaygon Monastery State Ovadacariya Abhidhaja Maha Rattha Guru Bhaddanta Kavisara and shared merits gained. 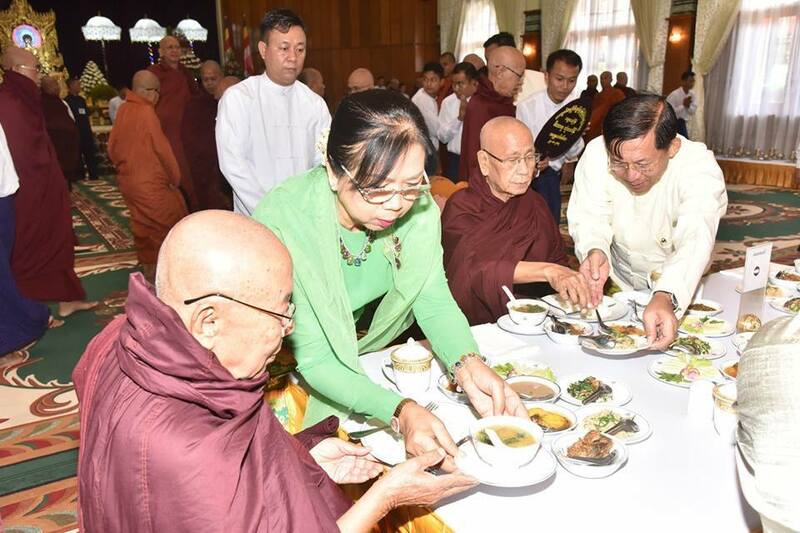 After the ceremony, the Senior General and congregation offered meals to members of the Sangha. 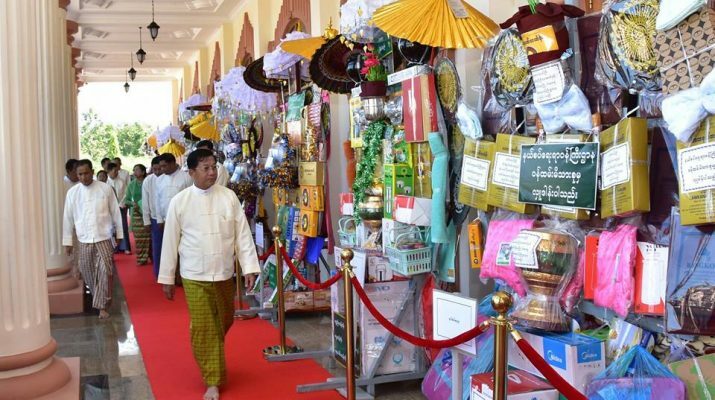 At the seventh Maha communal Kathina donation ceremony, offices and departments donated 83 Padethabins worth more than Ks-100 million. Those Padethabins were transported by relevant offices and departments to respective monasteries by vehicle. 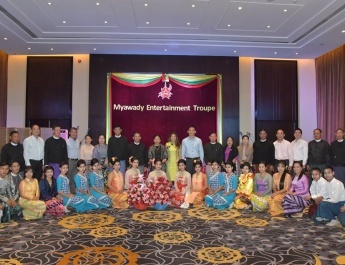 In the evening, the Myawady Band and Anyeint troupe under the Directorate of Public Relations and Psychological Warfare presented entertainments on songs, dancing and performance of Anyeint at Nawade Hall. Officers, other ranks and families of the Office of the Commander-in-Chief (Army,Navy and Air) enjoyed the entertainments. 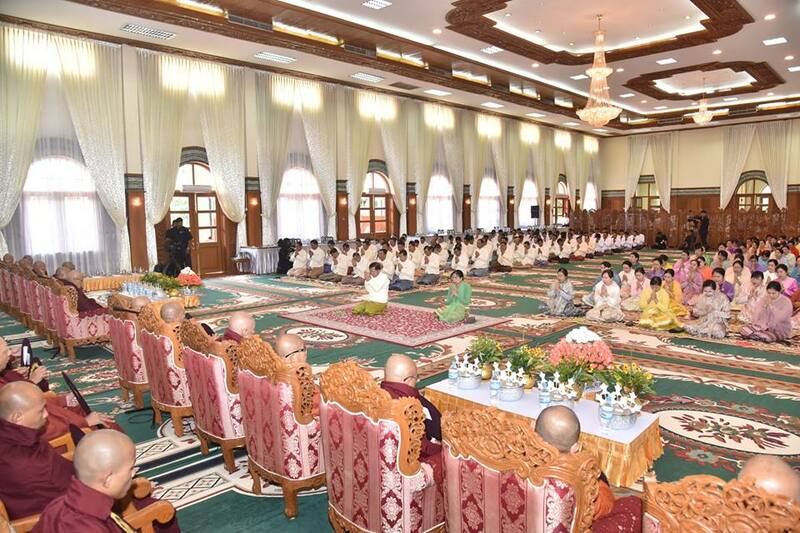 On 26 October morning, the Padethabins to be donated by families of offices and departments to the monasteries were conveyed on a grand scale round the housings of officers, other ranks and families, and the Ozi and Dohbat contests were held.